These legendary vessels were strongly built and designed to be handled by a man and a boy as they vied with each other for the lucrative trade of putting pilots aboard incoming ships in the outer reaches of the Bristol Channel. Working in the fearsome waters of one of the highest tidal ranges in the world, the ships bred skilful seaman who in turn demanded ever faster and more seaworthy vessels. The traditional rigged cutters, often referred to as pilot skiffs by the men who worked them, had a single gaff main sail with smaller topsail and two head sails though some in Swansea were ketch rigged with two masts. The average length of the pilot skiff was between 40 and 50 feet though some reached up to 60 feet. And they often sailed far afield in search of work, sometimes well south of Land’s End or across to the Irish coast and around Wales as far as Liverpool. In summer months, time was taken off for regular regattas between the pilot skiffs of various ports. Indeed an annual race continues to this day, organised by Barry Yacht Club, essentially for pilot cutters although open to all gaff rigged boats. Hundreds of these craft were built during the 19th and early 20th centuries. Many were built in the Bristol Channel on both the English and Welsh sides, but others were also built in Cornwall and Lancashire. It is believed that perhaps seventeen of these original pilot skiffs still survive today. Given the difficult sailing conditions and the cut-throat nature of the work, many were lost due to collisions with larger ships or being wrecked on rocks or shallows exposed at low tides. In one list of seventy-three pilot cutters, more than 30 percent of them were known to have been lost at sea. A good example perhaps is the Lizzie & May built by J.P. Hambly & Sons of Cardiff in 1890. Two years later, in 1892 she was wrecked after being stranded off Barry. Undeterred, the owner went back to Hamblys and ordered a replacement, also called Lizzie & May, which was launched in 1893. The following year she too was lost after a collision near the lightship. Lizzie & May was not a lucky name. There have been three pilot cutters named ‘Mischief’. The first was built in Swansea in 1876 for William Morgan, more commonly known as Billie Mischief and a fine seaman. When running before a gale on one occasion he put into Ilfracombe, not an easy harbour to get into in rough weather, with all sails standing and was able to bring her up without colliding with anything. It was a feat of great skill and was recalled for many years afterwards. Mischief however was eventually lost after a collision off Barry in 1888. William Morgan had a second Mischief built, this time by Thomas Baker of Cardiff, in 1906 and she remained in service until 1921. In 1952 she was bought by the legendary explorer Bill Tilman who sailed her for more than 100,00 miles including in hostile Arctic and Antarctic waters. Eventually, she was lost off Jan Meyen Island in 1968. Bill Tilman went on to own two more Bristol Channel pilot cutters, Sea Breeze, wrecked in Greenland in 1972 and Baroque, also built in Cardiff, in 1902, and which survives to this day under Swedish ownership and available for charter in Stockholm. 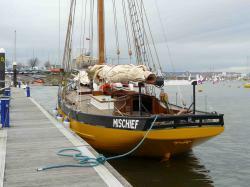 A third Mischief was built by Underfall’s Yard in Bristol and launched in November 2007. 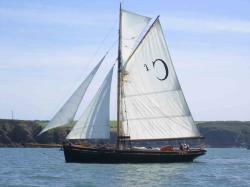 She too is available for charter, for expeditions on the west coast of Scotland. Pilot cutters are wonderfully graceful sailing ships and provide a nostalgic link to the past. A number have featured in films and television programmes and they are as popular as ever. At least ten replicas have been newly built in recent years.